I had every intention of getting some vindication on the Ironman Chattanooga 70.3 course this year. I made a plan, trained for it, and stayed healthy, but unfortunately it did not come to fruition as I expected. 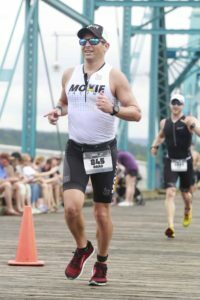 Last year I toed the line injured at Ironman Chattanooga 70.3, and struggled with all three of the events. The swim was not as fast as I expected. They controlled the water flow so the current was minimal. The bike was rolling hills of which I trained for and was much stronger on the bike, but I made the mistake of pushing the pace which completely screwed up my run. The roller coaster terrain of the run ended up beating me as I walked a huge portion of it. Last year I ended up with a 5:43:30. This Ironman Chattanooga 70.3 was going to be different. First, I was going to work with my coach on my weaknesses . Second, I completed a higher quantity of brick workouts including not only bike to run, but also swim to bike and swim to run. Finally, I maintained my recovery routine, which was a mistake I dealt with last year. My overall nutrition was better and I was in the gym a lot more. I really felt confident in my abilities to conquer the whole course and receive my vindication. The trip up to Ironman Chattanooga was pretty uneventful. Josh Wilkins and I drove up together which was a reoccurring theme from last year. The only exception was we followed Rick and Laura Jansik the whole way. Rick set us up with a room at the Marriott Residence Inn which was two blocks from the expo and transition. This was a nice change from last year where Josh and I stayed a few miles out of town where we had to worry about parking and timelines. This location gave us increased access to transition, the expo and swim start. We parked the car in the hotel parking area and didn’t touch it again until it was time to leave. The Ironman Chattanooga 70.3 expo was no different than any other Ironman expo. Vendors from nutrition, equipment and apparel companies littered the lot with their goods and a couple of small food trucks supplied some fast treats to fuel up the participants. On a surprising note, when I went to check-in I found out I was an Ironman All World Athlete. The All World Athlete program houses the top 10% of the age group athletes. It is separated into three tiers; the top 1% are considered gold, the top 5% are silver and the top 10% are bronze. Obviously, I am in the bottom of the tiers. I guess my age is starting to give me a little bit of an advantage. What was the difference at registration? The AWA athletes have their own entrants into registration which usually allows for a faster experience, and I was given the option of wearing an AWA swim cap versus the AG swim cap. For a free program, I’ll take it. The weather report loomed over us the entire week prior and, all the way up to the morning of the race. Satellite images and forecasts expressed a large mass of thunderstorms moving at just the right velocity to hit Chattanooga at the start time. The stir of conversation about the weather was popular among all the athletes competing. Some were worried about the swim being cancelled. Others were concerned about navigating the terrain of the bike course safely. The only agreed upon positive comments were about the run. No one cared if they had to run in the rain. It just meant it would be cooler. Either way the conversations around the weather were consistent with all of the competitors we chatted with. 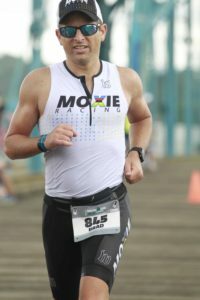 I was invited to two Ironman Chattanooga 70.3 pre-race dinners; one with Moxie, my national team, and one with Tribal, my training team. While my plans were to start at the Tribal dinner just to say wish everyone luck and then head over to Moxie, they derailed once I realized how far apart they were. The Tribal dinner at Food Works was delicious but it was the calm of athletes around the table which is what I really needed at the moment. 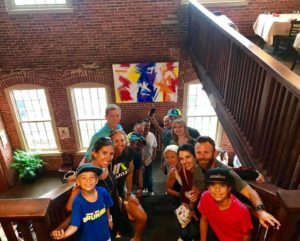 These were the people I train with all year long which at first is why I wanted to attend the Moxie dinner because I do not see those teammates, but at that time in which my mind was preparing for the race at hand, my heart wanted to be with these friends and training buddies. That night my light sleeping pattern made me aware of the lightning, thunder and rain enveloping the area that night. My dreams were plagued with worry of the bike course and entailed specific turns of the course where I may be in danger. I am never really worried about my own bike handling, it is the others cyclists I worry about, and my subconscious coupled with the storms brought those fears to the surface. Sometime during the night, my fears quelled, and I was lulled into a peaceful sleep. I awoke refreshed, excited and surprised. The weather conditions had completely changed. The storms had dissipated and the forecast only called for some possible scattered thunderstorms later in the afternoon. 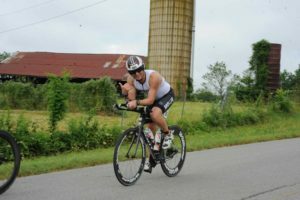 Ironman Chattanooga 70.3 was on with no deviations. There was a small change to the procedure this year. Last year we lined up for the swim start on a first-come-first-serve. The advantage being on the Moxie team was that a team sherpa went to the start at 4:15 am and setup camp so the team could just filter in when they arrived. This year the athletes still lined up but it was by projected swim time. My threshold swim pace is just below 2:00 per hundred which would be approximately 30-35 minutes, so I lined up in the 30+ minute swim line. There I found Oscar Alvarez and a few other Moxie teammates. We nervously chatted while preparing for the event at hand. My recent purchase of a ROKA Maverick Elite full wetsuit increased my excitement for the swim. ROKA’s introduction of their “Arms-up” technology resonated with me, due to my experience in Maryland. There I could feel the limitation in my shoulder mobility in the orginal Xterra Vortex wetsuit I had purchased 5 years prior. During my test swims and at Escape from Ft Desoto I was impressed with the flexibility in the arms which left no limitation to my stroke. This swim would further validate that. After an amazing rendition of our National Anthem, the gun went off for the professional athlete starts. Something was a little off though. The course starts with 300 meters upstream then turns for the remainder of the course down stream. The professional athletes were charting times of almost 5 minutes to get to the first buoy. As it turned out, the water flow was not controlled as much as it was supposed to be, so the current was a lot faster than expected. Due to the extraordinary amount of time it took to go upstream, the officials decided that the age group race would not include the upstream portion and the swim would be shortened. It was so ironic that all of us athletes were worried about the swim being cut-short or cancelled because of the storms, and here it was being cut short because of the current. After a twenty minute delay in order for the buoys to be moved and announcements to be made, the line finally started moving. My heart was jumping as it always does prior to a race. I really wanted to do well this time. My plan was to swim strong, but not overdo it, keep the power to 190-200 watts on the bike and run a 9 minute or less mile on the run. I went over and over this in my head prior to jumping off the dock into the 74 degree water. The Ironman Chattanooga 70.3 swim was no less than glorious. 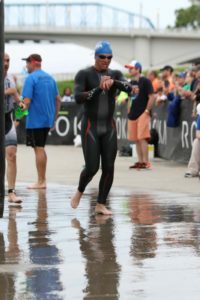 The early part of my plan was being executed as I easily rolled, reached and pulled my way toward the swim finish. My weakness in open water has always been sighting, so every few hundred meters even with sighting correctly, I usually end up changing to a breast stroke to get my bearings. This time, I was able to get through to the finish without changing at all. I did modify my stroke to a Tarzan stroke a few times to validate my sighting, but that was it. I reached for the volunteer helping us out of the water, stepped onto dry land and glanced at my watch. It was excitedly surprising to see my time 21 minutes. I knew the course was shortened and we were moving with the current, but it was still over 1400 meters. Not to mention, I felt amazing. Sprinting into transition with my wet suit in hand my thoughts went back to my plan. If I just stayed between 190 and 200 watts I would have plenty for the run. I rolled my socks on, stepped into my shoes simultaneously sliding my helmet onto my head and buckling it then slid my bike from the rack and ran out of transition. It still felt a little slower than I would like, but I was excited to be on my bike. Not to far after the 10 mile marker I was playing cat and mouse with a group of riders, when I saw a familiar kit standing at the side of the road with her bike down. It took me a minute to process that it was Yelena Maloney, a training partner from Tribal. I immediately turned around to see if she was ok. It was instinct. I didn’t even think I just found my body making the decision and executing. When I arrived to her location I asked her if she was ok. She stated, “I am fine. I have been here for 5 minutes already so my race is over. Just go.” I replied, “Just as long as you are ok” as I turned around to continue my race. The SAG vehicle arrived as I left, so I no longer felt the worried for my friend and I was able to concentrate back on the race at hand. prior to stopping. I still felt great, and at that moment, I was executing the plan as precise as possible. Some of the steeper and longer inclines did not allow me to keep my power range even in my highest gear, but they were so few and far between I didn’t think it would cause a major issue at the time. Around mile 40 I rode right into my first major obstacle. I was behind an athlete in a University of Florida kit when I decided I was going to pass him. USAT rules state that you have twenty seconds to pass and if the attempt fails you must slow to the six bike lengths behind the rider before attempting it again. I started to accelerate slightly in order to pass, but he accelerated right along with me. Not wanting to push my watts to much, after what I thought was 20 seconds I dropped back. Immediately, I realized I was slowing way down and was not getting any space between his back tire and my front. “Screw this” I thought, and started to accelerate to pass him with a little more force. Wouldn’t you know it, he accelerated right with me…again. Of course, I slowed down again to get acquire the regulated distance as my ears detected the sound of a motorcycle. One of the officials was headed in our direction. I motioned and yelled to the official that I was slowing down, but of course, so was my “friend” ahead of me. So, it looked as though I was drafting. As the official was writing in his notebook, I tried to tell him that I was slowing down and that he was slowing down too, but it wouldn’t be accepted by the official. He yelled to me to stop at the next penalty box and tell them I had a blue card. Due to the penalty I subconsciously equated the extra time, and immediately accelerated which would forgo my plan for the next 15 miles. I don’t exactly recall, but I believe my thinking was that I would get a 5 minute recovery in the box, so why not step up and try to make it up. Since the box I was going to end up in was located just prior to the dismount line, I wouldn’t have to power through any more before transitioning to the run. 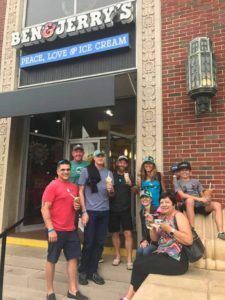 After arriving at the last Ironman Chattanooga 70.3 penalty box and releasing the negativity of the official, the volunteer stated that they were on a roll today and that a group of over 15 riders had just finished their 5 minute penalty. Just about as my time was at completion I glanced over at the runners starting their 13.1 mile leg and noticed Yelena speeding through the first hundred yards. As I yelled to her, I was surprised. That meant that she got her bike fixed and must have passed me into transition while I was stopped int he penalty box. I wondered what she had to have had to make up in order to get there that fast. I later learned she was four minutes behind me after the SAG staff was able to release her chain from being stuck behind the crank and get her back into the race. T-2 went smoothly and was only slightly delayed by my 47-year-old bladder that needed to be emptied. I was off and feeling pretty good even after the first long hill, but when I reached the first aid station I could already feel things start to slow down a bit. I was running under 9 minute miles, but I knew I couldn’t sustain it. My mind already went into fix-it mode wondering what I needed in order to get send whatever I needed to my legs in order to maintain my cadence. After the mile 3 aid station a side-stitch reeked havoc on my insides and I slowed to a walk, but I was determined to keep the walking to a minimum. This was going to be a long half marathon. I continued to walk every mile or 1.5 miles for a minute or so, before picking up the pace again. I grabbed everything I could think of in order to fuel my glycogen stores and sometimes it worked. Coke and Red Bull both would give me an instant lift, but it would only sustain me for a short duration before my legs would tire, the stitches would return and I was forced to slow down again. Coming across the Chestnut street bridge to complete the first loop I caught up with my workout wife, Sonja Olsen. She was obviously upset. She mentioned she had an amazing swim and did really well on the bike, but was now frustrated because her run was less that she’d hoped. “Join the club”, I thought to myself. The interesting thing she said, was that she didn’t want to let anyone down. I immediately went into a diatribe of how triathlon is an individual sport and the only one she would let down is herself. If she was doing the absolutely best she could, and that she honestly couldn’t push any more, that she was letting no one down. own race. The rest of the race, when ever I felt like I had to walk, I would ask myself honestly if I needed to or could I continue. More times than not I didn’t have to and I would keep running. I reached the Chestnut Street Bridge for the final time and I picked up the pace. Everything hurt. My legs were like lead weights, I had stitches on both sides and I was a little light headed, but I was way to close to stop running. 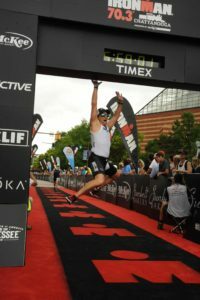 Jumping and touching the arch with some sort of flair has become a popular way to finish at Ironman race for the Moxie team. As matter of fact, one of the members prints up calendars for the following year with all the dunk pictures. 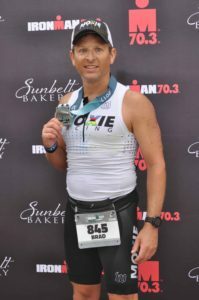 While running up the red Ironman carpet toward the finish, the energy to try and make a Moxie dunk alluded me. However, I did try and while at the time it seemed kinda wimpy, the picture made it seem not so much. I crossed the Ironman Chattanooga 70.3 finsh line with a time of 5:25:55 which is a PR altogether by over 10 minutes. Unfortunately, the swim was over 500 meters short. Using the average pace and adding it back it would give me a 5:36-5:38. Subtracting the penalty of 5 minutes the actual race time would be 5:31 which would be a PR by 4 minutes. This of course is not reality. I cannot go back and swim those meters or erase my penalty, so while Ironman will consider it a PR I will not. The rest of the day consisted of rest, beer, burgers, ice cream, good company and fun. It was still a tough race and while I did not get my vindication, I still progressed. I am proud of my race, but that was then, and now it’s time to focus on Ironman Costa Rica 70.3. The Coke and Red Bull on the course were causing a surge in my pace and it made me feel better. It can only mean that I am not getting enough nutrition on the bike. I will go back and reassess what I need and make sure that it doesn’t happen again. My coach made me realize my swim volume has been down, which is not surprising( If I had to skip a workout, it would mostly be a swim and I would move the other workouts around to accommodate.) I need to get my volume up in order to swim my way to a better bike split. In other words, gain the fitness and technique to increase my efficiency and economy in the water. The stop for my teammate and the penalty made me increase my wattage on the bike which most likely drained me a little for the run. No matter what happens keep to the plan. Triathlon is not won on the bike, but it can be lost. If I put these lessons into place, it should at lease help me succeed in my goals to continue to be healthy and decrease my time on the course. With the exception of number 2 I should be able to incorporate the other lessons for Costa Rica.